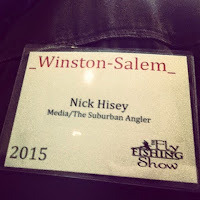 I know I'm about a month and a half late, but I wanted to make sure and tell you guys about my trip to The Fly Fishing Show in Winston-Salem, North Carolina. It got off to a pretty rocky start, which, unfortunately, put a damper on the whole weekend, but I got to meet some cool people and sit in on some awesome lectures. In spite of some cooler temperatures being forecast, I opted to take the tent and camp at a nice little campground called Midway about 25 minutes outside of Winston-Salem. 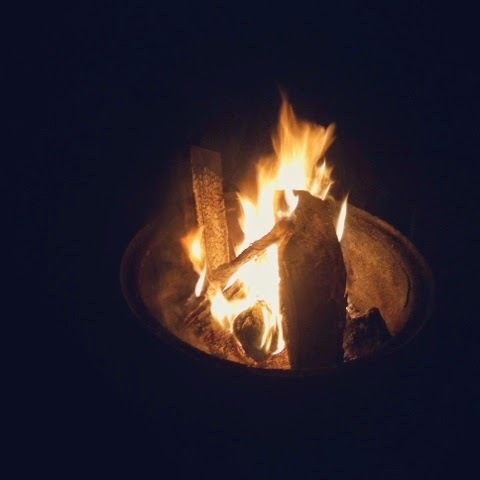 It gave me the opportunity to put some cold weather camping techniques that I've wanted to try to the test. A few sock-covered Nalgene bottles full of boiled water tucked into the sleeping bag a few minutes before bedtime makes a world of difference! I stayed comfortably warm, even when waking up to 12° F and ice in my mustache!! The Winston-Salem show was a Friday and Saturday event. I got up the first morning and stopped at a McDonald's on the way in to grab a hot coffee and a breakfast sandwich. Unfortunately, I didn't get much further that morning. As I was leaving the restaurant, a driver in the oncoming lane to my left fell asleep, drifted into my lane and took the front end off of my little Escape. I spent the next 4 hours in the McDonald's parking lot calling insurance and car rental companies trying to get the ball rolling and trying to figure out how the hell I was going to get home! I want to take a moment to say a huge and very well deserved THANK YOU to Mike from Mike's Wrecker Service in Mocksville. If any of you reading this are ever in need of a tow truck in that area, give Mike a call. He helped me out a lot, did a great job towing my car and really gave me some great advice on the whole process. It was a good little car. 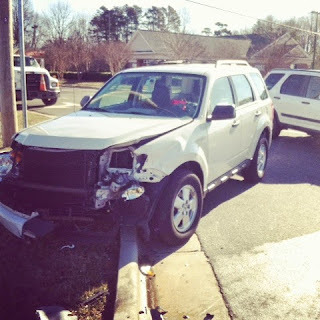 I'm very thankful that I wasn't injured at all in the wreck, but it certainly made me think hard about attending the second day of the show or just driving home. Well, I guess I'm a glutton for punishment, because I stayed two more sub-freezing nights in the tent so I could get my fly fishing gear fix. To say that I wasn't in the best frame of mind for attending a show is a bit of an understatement. As a result, I'm afraid I didn't take as many photos as I wish I had. The thing I enjoyed most about the Winston-Salem Fly Fishing Show was the number and variety of presentations and lectures offered. From fly fishing in Great Smoky Mountains National Park to the Bahamas to Alaska, and those are just a few of the presentations I attended. One of the most fascinating was a presentation from a gentleman named Ozzie Ozefovich on The Underwater World of Trout. Ozzie has combined his lifelong love of trout with his lifelong love of the video camera and through his camera's lens he sheds light on the secret world of his favorite fish. Not only does he study and explain the habits of the fish themselves, but Ozzie also runs tests to determine how the water currents change through the water column and how different structures affect the stream flow. Ozzie had compiled his research and footage onto 4 dvds that are available for purchase through his website. I plan to order them, so look for a review here later in the year! A highlight of the show for me was meeting and speaking with Cecilia "Pudge" Kleinkauf, the director and guide of Women's Flyfishing Alaska. She's such a wealth of information and experience and her passion for the sport is contagious. Pudge has authored several books and many articles on flyfishing in Alaska, she has hosted a podcast and been interviewed by the Ask About Flyfishing podcast. 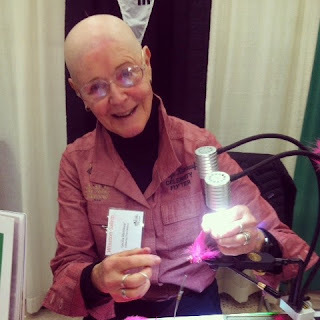 I got to speak with Pudge while she was working her table on Tier's Row, she told me she's a regular at The Fly Fishing Shows. I feel very fortunate that I got to meet and speak with her and I hope I get the opportunity again some day. 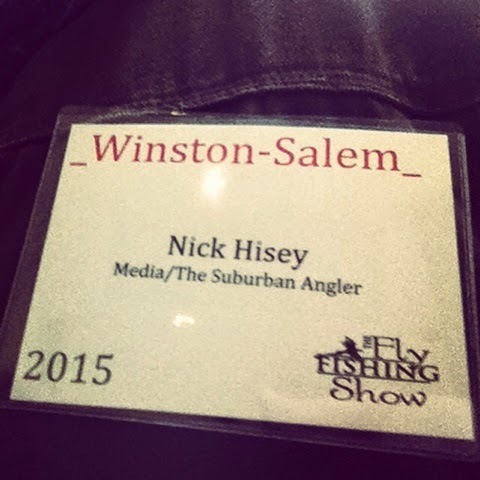 Even though things got off to a rough start for me with this trip, I thoroughly enjoyed attending The Winston-Salem Fly Fishing Show. If there's a show in your neck of the woods you really ought to check it out. The lectures, the exhibitors, and the fly shops that are represented really make for a great show. I'm going to try to attend again next year, but I might have to get a hotel and I won't be going to McDonald's for coffee!! !